For over twenty years, Tommy Caruso has been handcrafting sheets of metal into complex curvilinear shapes in the service of restoring and recreating vintage cars from our rich automotive past. Using custom dies and tooling, wooden bucks, urethane foam, modeling clay, and skills gleaned from a knowledge of old world craftsmanship and current technology, vintage automobiles are brought back to life and restored to their former pristine glory. 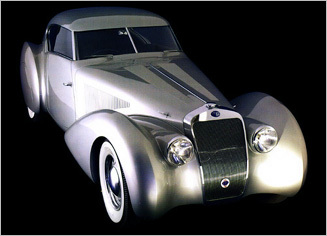 Some of the world's finest automobiles have passed through Contour Metalshaping's shop on their road to restoration.